So, after countless sunny days, many training rides in the heat… it only tipped it down on the day, more or less all day. It almost but didn’t break my spirit on the day… all I had to do was think back 12 months ago and remind myself that I followed the event from hospital bed, probably receiving blood transfusions that day also. 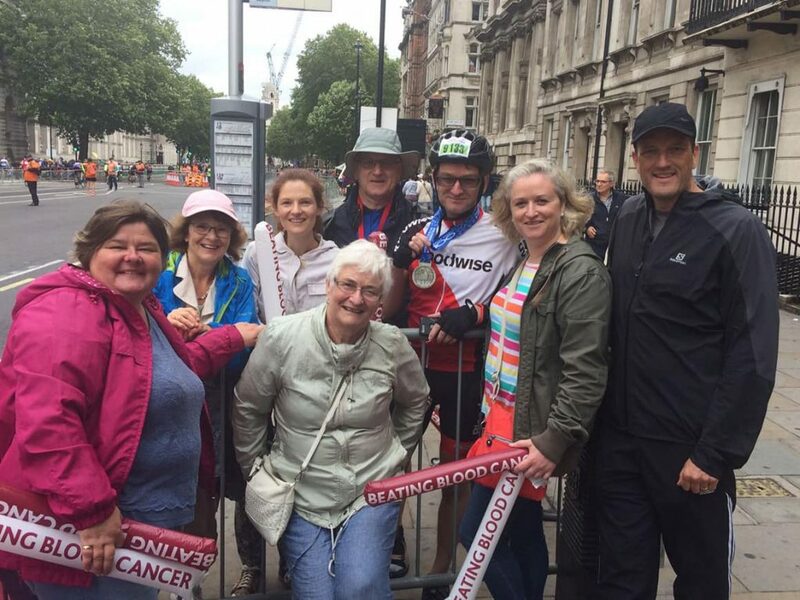 Crossing the finish line was special.. but not as special as the roar from the support team at mile 99 . The build up for the weekend started on Thursday when I visited the Excel centre in London to pick up my riders pack. I will not deny getting very emotional as I entered the exhibition floor and when signing for my pack. It was nice to stroll around the exhibition and resist spending lots of cash on unnecessary toys! 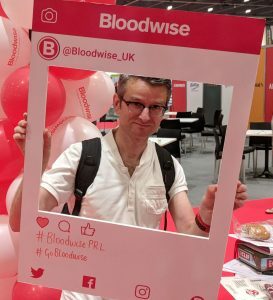 After picking up a couple of freebies and buying some food for the ride, I went off in search of the Bloodwise stand to say hi to the team and find out a bit more about where they would be on the day. The support team (Mam, Dad & sister Claire, as in, Claire my sister, she isn’t a nun…) arrived from Ireland on the Friday before so we could spend some time together before the ride. 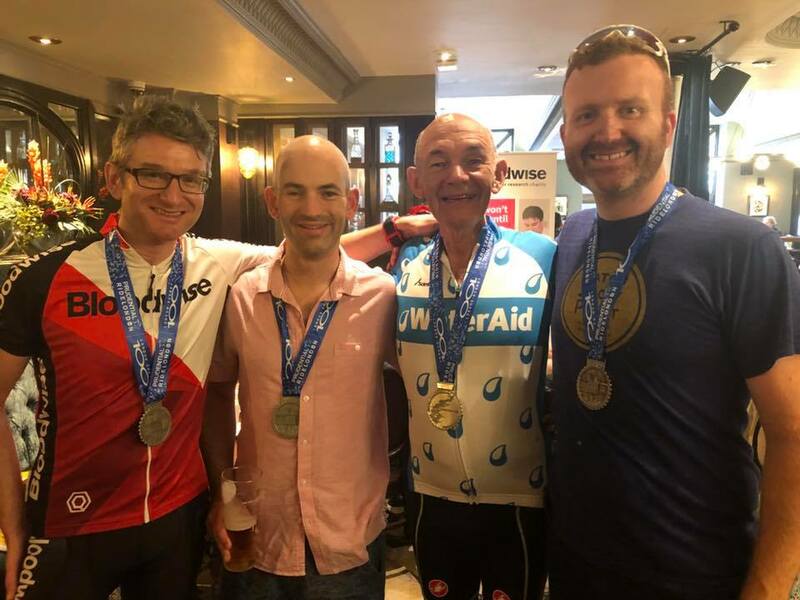 The in-laws were also over from the Isle of Man, as both father in law Julian riding, as was Tom (who both raised money for Bloodwise also) and Alex (raising funds for the British Lung Foundation). 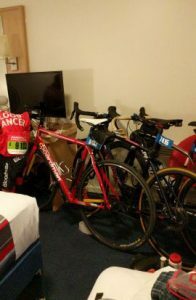 The plans were agreed, meetup for pre-ride meal on the Saturday, early night in Travelodge not to far from Stratford, early start, wait a bit, ride 100 miles, then celebrate. The pre-ride meal was as expected a pasta-fest in a rather trendy Italian restaurant over in London City Island, a new development of presumably shoe-box styled “luxury” apartments near Canning Town Tube. It was great for the parents and in-laws to catch up again, it has been a few years since they last caught up (when MrsQ was performing Chess in Cardiff I think, 8 years or so ago!). We had a nice meal, good catch up and chat then it was time for us to retire and get ready for the ride. of day (well, not for JP, wolfs down food any hour!). Tom, JP and I rode to the start together, letting JP off as Tom and I were Green start. JP was scheduled to start shortly before me, with Tom shortly after, then Alex who as later again. Tom and I ended up starting together, as with the crowds, stopping for a final safety pee meant that I’d missed my slot. It didn’t matter really so Tom and I rode together the first fabulous 15 or so miles towards Hammersmith, when I think the rain started for us. It didn’t stop for me I don’t think until I was at Richmond on the return loop! Unfortunately for Tom, he punctured on the way into Richmond Park and after giving me the OK to keep going had to stop. JP also suffered punctures which are a pain at the best of times, but in the driving rain and wind and the cold a real pain in the arse. One rider en-route commented to me that this ride is like wacky races there are so many upside down bikes en-route, people fixing punctures. I had to stop at one point (mile 29 to be precise according to my tracker) to take my specs off. It was a choice between not being able to see with specs, and not being able to see without. I felt it was more predictable without. So, remaining 70 miles went by in a blur, literally. I kept a steady pace for the ride, keeping eye on pace with TomTom Sport watch, until battery died going thorough Dorking. I didn’t fade though, pushing up Leith Hill, followed by Box Hill etc. It was a bit annoying not to have telemetry for the remaining ride, but I know now to ensure full battery next time. This ride I was fortunate, despite the conditions (the descents were slow, and due to the rain, the roads were quite strewn with debris from trees due to the rain), I wasn’t held up with any stops due to accidents. In fact, I stopped to remove specs, and then a couple of further stops for traffic management in Raynes Park or somewhere, other than that, I was in the saddle for entire time. 41 seconds short of 6 hours to be precise. I had my GoPro setup to record finish in time-lapse. I switched it on at around mile 97, but I should have used video instead, as the interval of the time-lapse meant I missed getting picture or footage of the Bloodwise support team at mile 99 which was where my family were waiting. I did get a great picture as I was just about to cross the finish line. 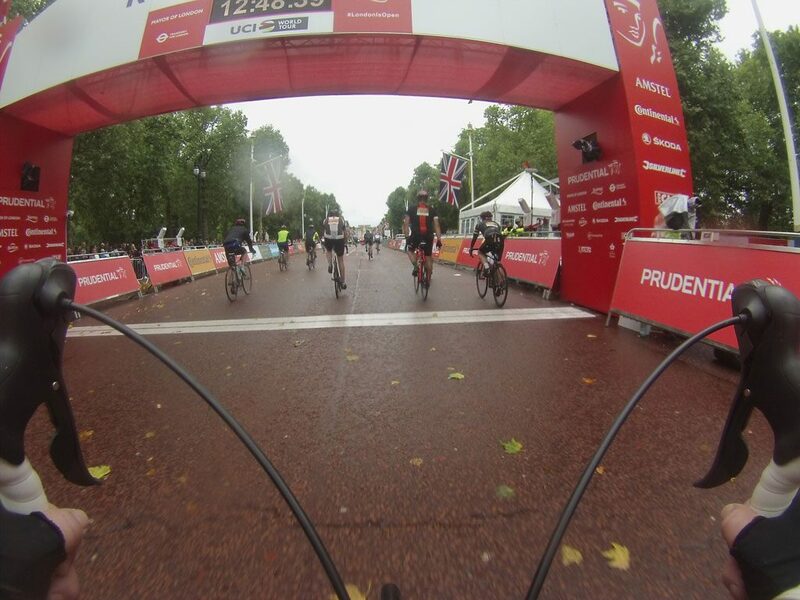 About to cross the finish line…. After we’d all finished we agreed to meet up in Harry’s Bar on Piccadilly, where Bloodwise were having a reception for their riders. I’d let them know that I’d pop in to say hi, thinking I’d then catch up with the family support team, however, it was easier for us all to go there. It was great to meet the Bloodwise team and they were so hospitable to my extended family support group. We had a couple of beers, some food, and warmed up a lot! It was also great to meet other Bloodwise riders and fantastic for my group to meet other survivors of blood cancers, many years in remission now doing their bit for the charity. 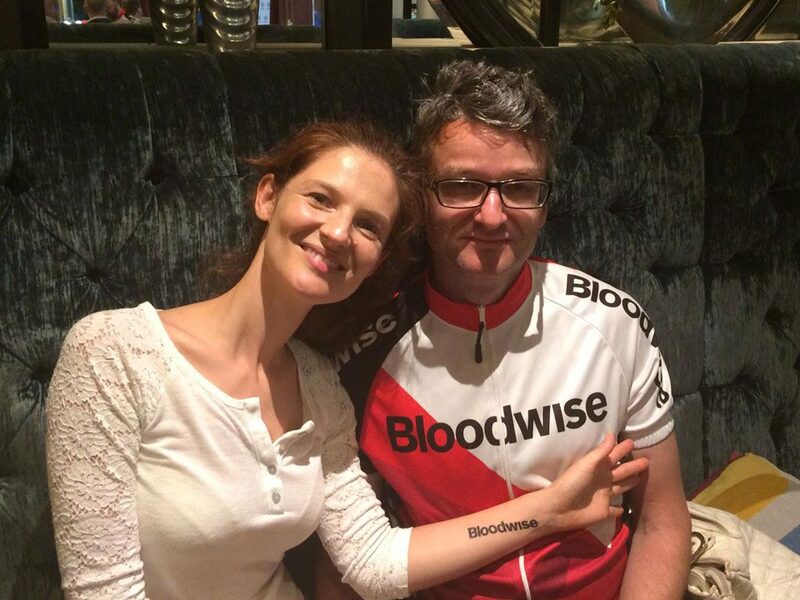 Speaking of which, I exceeded my fundraising target, raising a total of £1200 (excluding Gift Aid) for Bloodwise. JP and Tom also had separate fundraisers, I believe JP raised the majority of his at an Isle of Man Choral society event, Tom using fundraiser on Facebook to raise awareness and raise funds there. I was grateful to be able to thank many of Tom’s sponsors last weekend at his 40th birthday party. I thank all my sponsors for their donations. Last but not least, I thank MrsQ, Helen for accommodating me disappearing for training rides in May, June & July especially after our house move and there are still some boxes to be unpacked! I’m also grateful for Helen’s massage therapy skills too to sort me out on Monday! 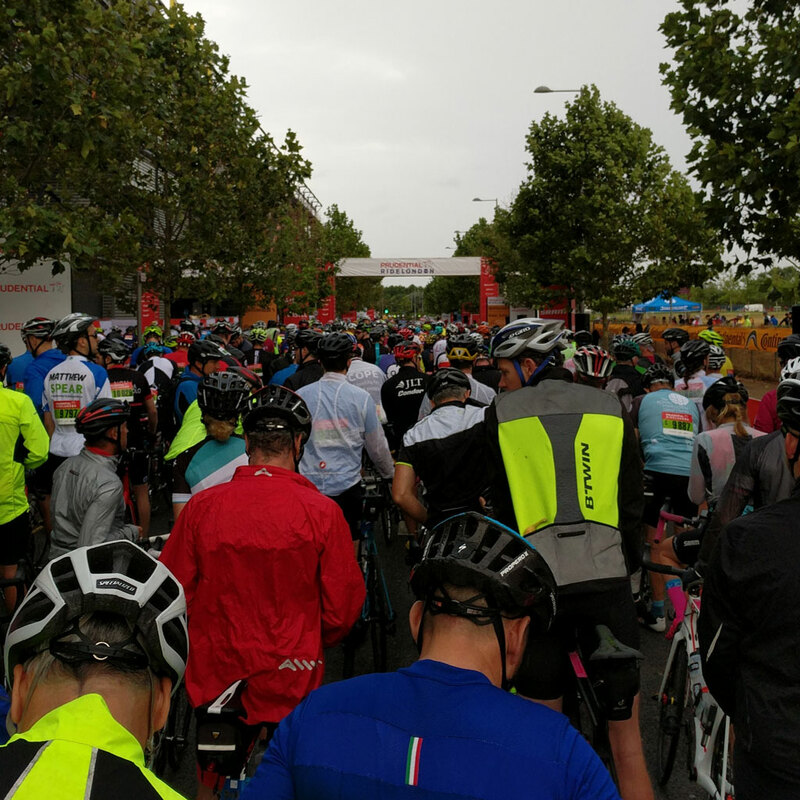 After a week off the bike, I went out for a short ride last Saturday, well, I have to stay in shape, I’m doing my first Wiggle Sportive tomorrow… a short one, only 96 miles.